Most people don’t realize that you can have a winter blooming garden in the depths of January and February in large areas of the U.S. I live in the mid-Atlantic region and we can get some heavy snow falls, and days where the temperature dips below freezing for a good part of the winter, but still it is possible to see something blooming 365 days a year. And that is my goal – to have something blooming in my garden every day. The hardest time of year is early January but as the winter progresses, I notice more and more plants are blooming. 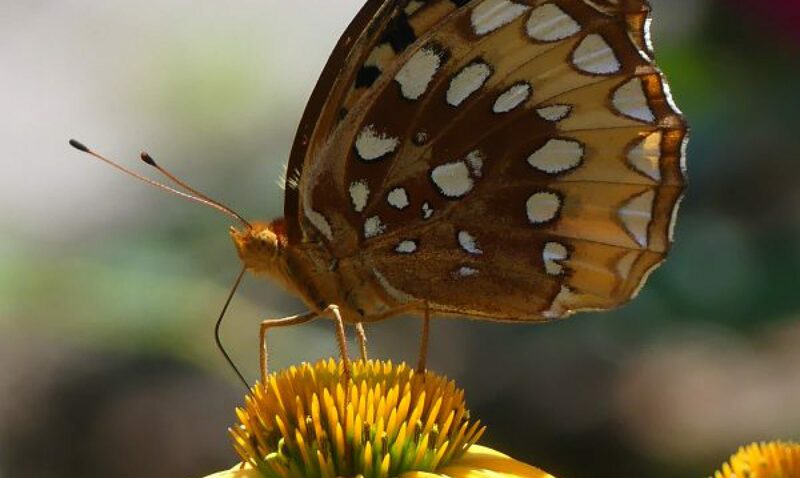 Floral sources helps my bees to find some nectar and keep them alive over the winter, plus gives me a lift when I see blooms unfurl throughout the winter. Witch Hazel or Hamamelis is a small tree or large deciduous shrub that has coarse foliage during the growing season and is really unremarkable looking. But once the leaves fall and winter sets in, you can see the swelling flower buds and as winter is fading away but still very much around – late February for me – the Witch Hazels start to bloom. The most common color is yellow, but oranges and copper reds are available. Doing well in woodland conditions of high shade, you can also site Witch Hazels in sun and they will thrive. It is an easy plant to espalier or grow flat against a wall or house. One of my honeybee’s favorites. These start opening in mid to late January and when a warm day hits, they are fully open and jumping with bees. Grown from a tuber planted in the fall, they will steadily increase from year to year by throwing off seeds. Only about 6 inches high, the flower has a Kelly green ruff of foliage framing the petals. Aconites are an ephemeral, so will disappear when the weather warms up. Transplant them when green and actively growing to spread them around. 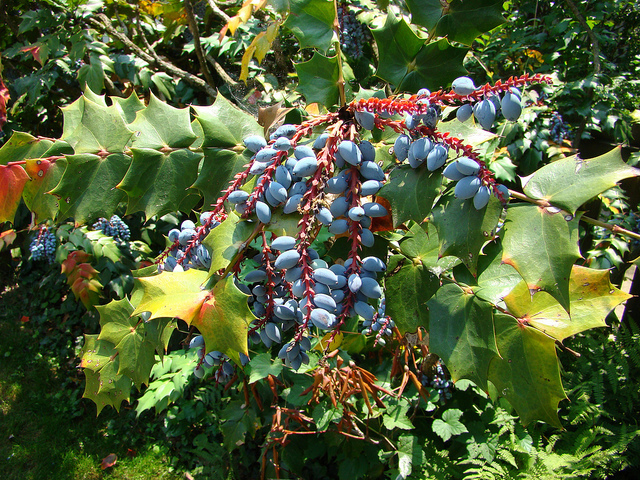 Mahonia bealei is an unusual plant that you either hate or love. It is a mid-sized shrub with large leathery prickly leaves that looks like a holly on steroids! The flowers open gradually in February, sometimes earlier, and set a blue-black berry that birds love to eat. A tough deer resistant plant, it is under-utilized in the landscape. 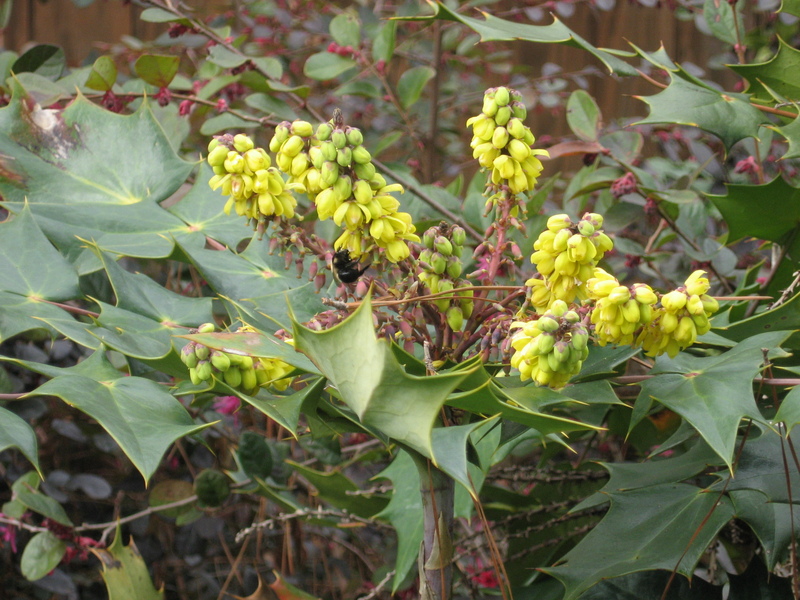 Mahonia likes shady, difficult conditions, so is a valuable plant to know. Camellias are considered a southern plant and are very successfully grown in Maryland. 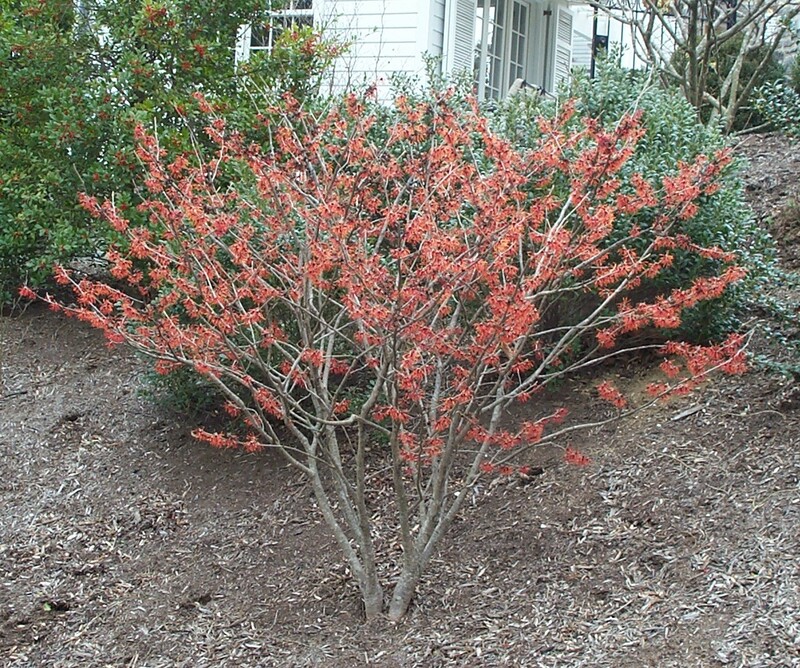 It is an evergreen glossy-leaved shrub that blooms in the dead of winter. The flowers look like a flattened rose and come in an array of beautiful colors and swirls. 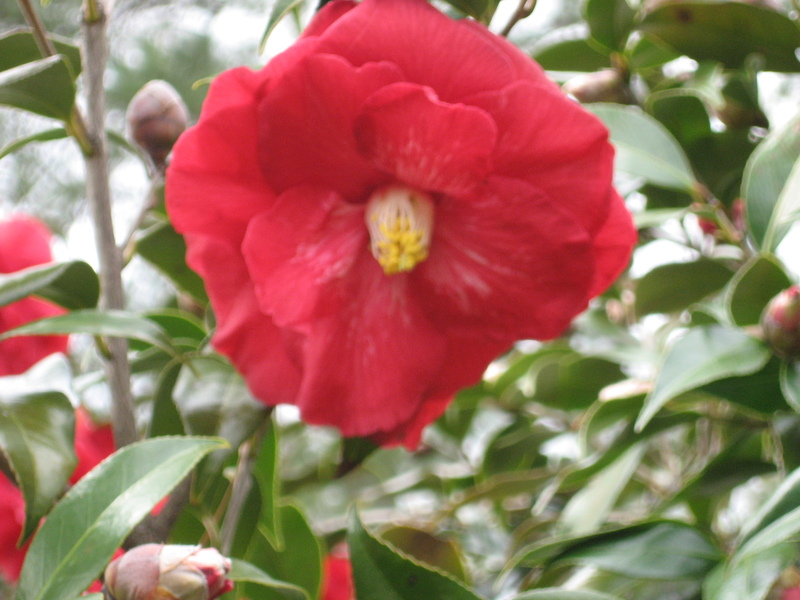 Camellias prefer shade and can live under large trees. 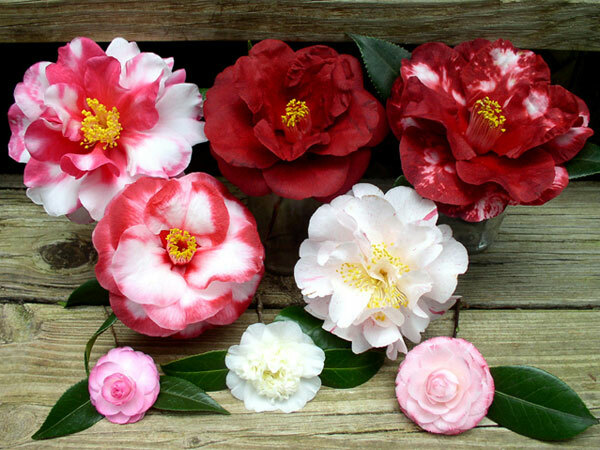 There are Camellias that bloom in the fall and ones that bloom in the winter. In the south, they can get quite large, over 2o feet tall, but here in Maryland, they tend to be a lot smaller. But I have seen some large ones here when they are growing in a good protected spot. 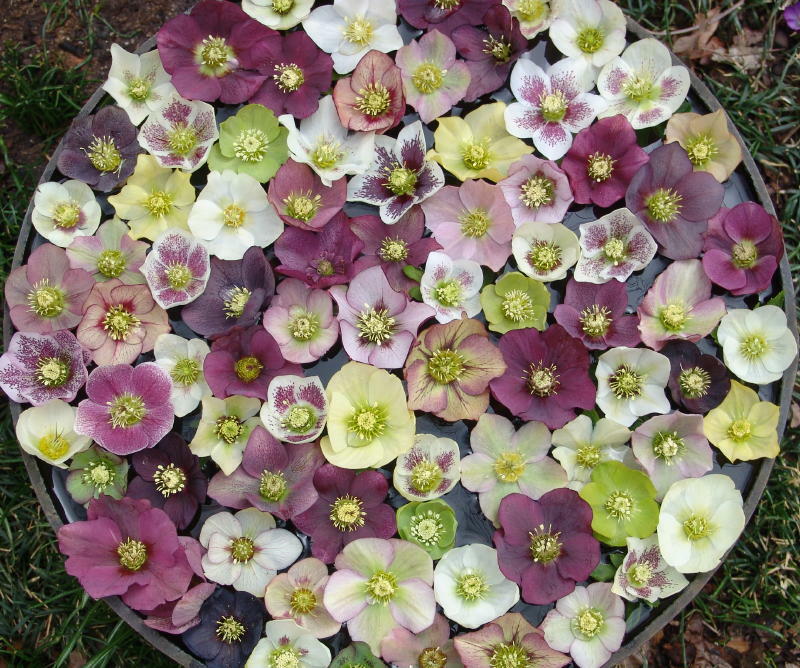 No garden is complete without Hellebores or Lenten Roses. A great ground cover for the shade, hybridizers have gotten hold of this plant and have developed some amazing colors, such as dark burgundy or black or yellow. 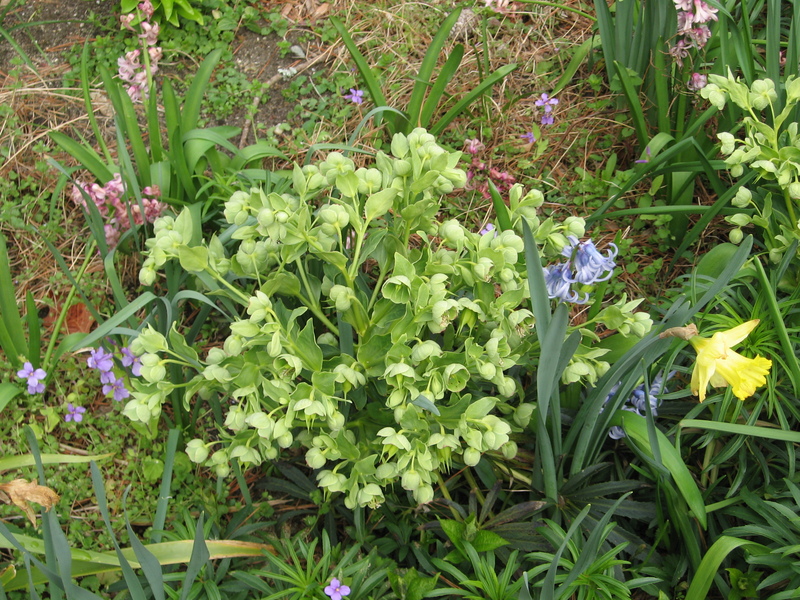 I love the lime green Hellebore foetidus, or Stinking Hellebore. The leaves smell unpleasant when crushed but I have yet to crush them to find out! I am a sucker for green flowers and try to grow as many as I can. 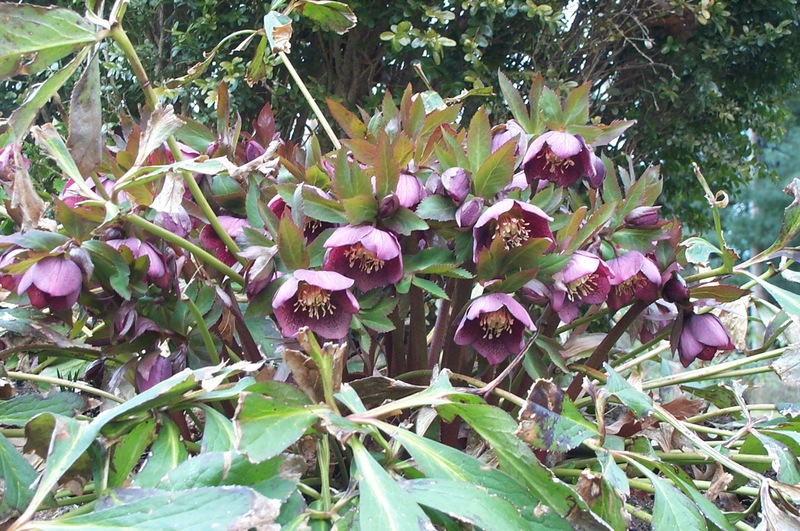 Hellebores like woodland conditions- humusy, rich soil, in dappled shade. They are valuable because they are evergreen, long-lasting, and deer avoid them as they are highly poisonous. I have noticed that Hellebores have become a popular holiday house plant like a poinsettia. Great Frog! I love witch hazels and keep promising myself some but they’re so expensive here (and I’d like three). The last photo is lovely! They are expensive. Try to get a smaller one, instead of starting with a 4 foot tall one. Most definitely! 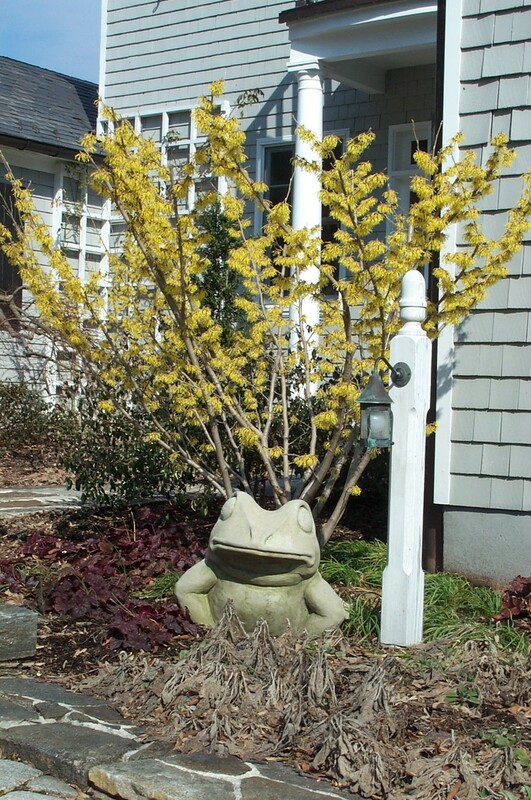 Witch Hazels, Hellebore, and even a few daffodils are blooming! I’m envious, the Camellias are so beautiful. We live in a zone 3 and actually don’t currently have a yard but enjoyed over 25 years of gardening in a house we sold 1.5 years ago. Since we normally get a ton of snow, nothing is really visible during the winter. Sometimes A Clametis left on a trellis can be pretty or even red twigged willow…and of course the spruce look night with Xmas lights. My favorite in the snow is my yellow twigged dogwood! Next PostNext Broken Pot Garden- Home for a Gnome!